It’s that time of year again where we gear up for CHI. For us this means we’re also gearing up for our #CHIversity campaign! If you’re new here, #CHIversity is a grassroots campaign that we started back in 2017 to make the conference more welcoming and friendly, and to create spaces for newcomers and oldies to come together to build feminist community. you can see what we were up to in 2017 here, and some of our activities from 2018 here. Last year, things got a little out of hand with the keynote, so we worked with a large group of feminist HCI researchers to write two open letters: (1) to first time CHI attendees; and (2) for the wider CHI community. The #CHIversity launch event. Similar to last year, we are hosting an event on Monday night to celebrate the beginning of our campaign! This is a dry and quiet event that functions not only to meet other fabulous feminists, but also to counter the party-culture of CHI. There will be tea, coffee, biscuits, badge-making, crafting, zine making, and you’ll get to talk to some of the nicest people who are at CHI! The #CHIversity zine. We are continuing our tradition of documenting our CHI experiences in a zine – we are meeting every day in the afternoon to work on the zine, but you are also more than welcome to make pages with your friends and bring them to add to our zine! The 2017 outcomes can be found here, and the results from 2018 are here. Our #CHIversity collaborative crafting. In 2017, we worked on a bit of collaborative cross stitch to raise awareness of Planned Parenthood. In 2018, we made a collaborative multimedia quilt, and this year, we will be collecting 100 wooden pieces on the topic of “#CHIversity – that’s me!” to show the many different people and experiences associated with our campaign! New this year: #CHIversity name badge flags! This year, the fabulous Rosie Bellini has designed a flag that you can attach to your name-badge to show your support of fempower.tech and #CHIversity! In our true guerilla style, we’ll be placing them somewhere near the registration desk so grab one before they’re all gone. New this year: #CHIversity meetups! This year, we will be hosting a series of meetups for people to come together. We have organised a few in advance, but would also love to advertise some impromptu meetups on specific topics! Some ideas include a meeting for precarious postdoctoral labourers, PhD student meetup, or specific research areas! Use #CHIversity on twitter to advertise and/or DM us and we’ll tweet about it! This includes daily meetups to work on the #CHIversity zine in the afternoon coffee break. We are also hosting guided meditation sessions every day in the morning coffee break. Janis and Arlind will be leading these, and will let you know via twitter once they found a suitable location in the conference venue for this. 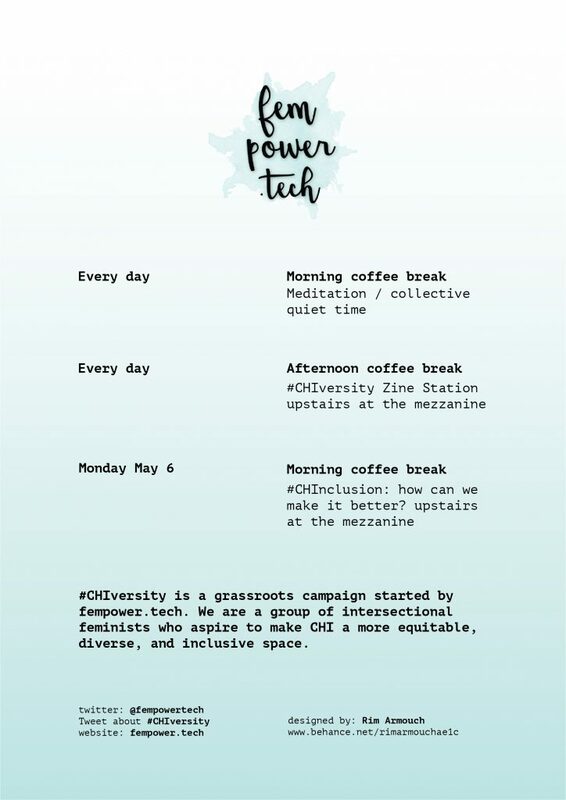 We’ll be sharing up to date information on Twitter, so make sure you follow us @fempowertech and the #CHIversity hashtag throughout the conference!